Spotlighting the captivating history and culture, coastal sites, culinary delights, conservation efforts, film locations, and adventure activities of Split and Dubrovnik, Greenloons offers sustainable family travel options that make traveling to the region more meaningful for local communities and visitors alike. View from Lovrijenac Fortress, often called "Dubrovnik's Gibraltar"
This trip provides families the chance to explore the less traveled routes of southern Croatia thereby getting to the heart of what, to me, makes it one of the most special places in Europe. 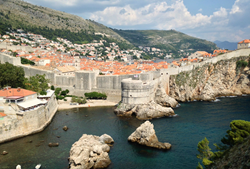 Greenloons is offering eco-minded explorers the chance to tap into their fondness for all things 'Game of Thrones' with a new custom trip added to its Green Vacation Collection, the Southern Croatia Sustainable Family Adventure. Set against the backdrops of the ancient fortresses, stone walls, and churches featured in the television show, families will have the opportunity to learn about history and local folklore, participate in cycling, hiking and cooking activities, stay at distinctive lodgings, and immerse themselves in the beauty of this coastal region. "We are proud to be featuring local, unique and sustainable travel options throughout this community oriented and socially aware Croatian experience," says Irene Lane, the founder of Greenloons who personally vetted this adventure earlier this summer. "This trip provides families the chance to explore the less traveled routes of southern Croatia thereby getting to the heart of what, to me, makes it one of the most special places in Europe." Greenloons is a premier online travel resource dedicated to inspiring people to think different, be different and travel different – in ways that help to ensure a more sustainable planet. In addition to being a recent recipient of National Geographic Traveler magazine's 50 Tours of a Lifetime, Greenloons is an advocate of social empowerment, financial viability, and environmental preservation connecting mindful travelers with unique and eco-certified travel experiences all over the world.